Welcome to the Hanen Book Nook! We're excited to share some of our favourite children’s books and talk about ways you can use them with young children to promote their emergent literacy skills. Every month, we take a fun children’s book off our shelf and talk about some simple ways you can use it to build the critical foundations of learning to read and write. What are emergent literacy skills? Emergent literacy skills refer to everything children need to know before they can learn to be successful readers and writers. Studies have shown that children who start school with higher levels of these skills have greater academic success. Vocabulary – How many words a child understands is one of the most important factors in learning to read. The more words a child knows, the easier it is for her to learn new words and to gain meaning from the stories she reads. Story comprehension – Experience listening to and understanding stories will eventually make it easier for a child to read and write stories on her own. Print knowledge – Before a child can read and write, she must understand how print works. For example, she’ll need to know that print is made up of letters of the alphabet, that letters combine to make words and that print is read from left to right. Sound awareness – To be prepared to read, children must understand that words can be broken down into syllables and smaller sounds, and that letters correspond to certain sounds. Many emergent literacy skills can be picked up during book reading, but the way you share books with children can make a big difference to how much they learn about literacy. I’ll be sharing helpful tips and strategies for how you can tweak the way you share books with children so that you can best support their early literacy development. To make sure your child is getting the most out of book reading, it has to be an enjoyable activity, where he or she is actively engaged. Rather than reading the book from start to finish while the child sits and listens, saying very little, reading with your child means turning book reading into a conversation. To read with your child, pause during the reading to ask questions and make comments. This will give your child the opportunity to answer questions and share his or her own thoughts and feelings on what’s happening in the story. As a child engages in a conversation, she can draw on her knowledge and experience to make new connections, form new knowledge and build language skills. The better her conversational skills now, the easier it will be for her to understand what she reads later on. 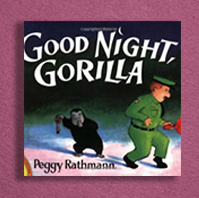 For tips on making book reading interactive for young children, see “Creating Conversation with Good Night, Gorilla”. The tips and strategies we share in the Book Nook are from two guidebooks on emergent literacy – ABC and Beyond (for educators) and I’m Ready! (for parents). These guidebooks are based on the most current research in emergent literacy and offer practical interaction strategies for nurturing emergent literacy skills during book reading and other daily conversations and activities. Many of my entries in the Book Nook involve reading the book more than once. This is because practice makes progress! The more you read a book, the deeper you can delve into its meaning. Furthermore, children learn through repetition and usually enjoy reviewing books they already know. Try reading the same book 3-5 times over the span of a week or two. There are so many books to choose from, and many possible emergent literacy skills to focus on. Where do we start? Sometimes the amount of choice can be overwhelming. By providing concrete examples of how we use some of our favourite books to support emergent literacy, we hope to inspire you to do the same, whether you are reading with children in a classroom or at your kitchen table! Turning Book Reading into a Conversation Look! Building Early Vocabulary with Where’s Spot? Sign up for the Hanen Newsletter and get the latest Book Nook posts sent right to your inbox!